The Oxfordshire, set in the rolling hills of the Chilterns, is located approximately 45 minutes drive northwest of London on the outskirts of the historical university town of Oxford. Designed and built by the world-renowned architect Rees Jones, his first in Britain. No expense has been spared in creating this beautiful course. 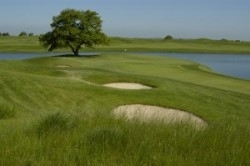 A tactical blend of bunkering, strategically placed lakes, wispy rough and wind make this a real challenge. Combine that with its natural beauty and you have all the course you'll ever need. The Oxfordshire also offers one of the finest clubhouses in the country with conference facilities for up to 200 people, a fabulous restaurant that provides Continental and Japanese cuisine, a lounge bar, a spike bar and a traditional Ofuro bath house. The Oxfordshire has found the perfect blend between business and pleasure, so whether you're interested in playing a round of golf, becoming a member, hosting a conference or having a wedding you'll find everything you could possibly want right here.